Summary: “Despite the tumor-shrinking medical miracle that has bought her a few years, Hazel has never been anything but terminal, her final chapter inscribed upon diagnosis. But when a gorgeous plot twist named Augustus Waters suddenly appears at Cancer Kid Support Group, Hazel’s story is about to be completely rewritten. 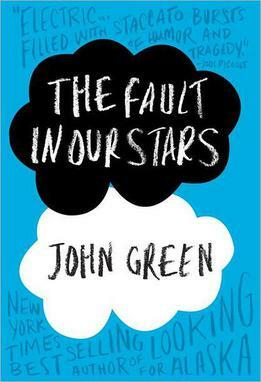 Insightful, bold, irreverent, and raw, The Fault in Our Stars is award-winning author John Green’s most ambitious and heartbreaking work yet, brilliantly exploring the funny, thrilling, and tragic business of being alive and in love.” (Summary found on Goodreads). John Green’s The Fault in Our Stars is a beautiful novel that, even though I do agree that it is beautiful, got more attention than it deserves. I for one prefer more action in my books. Everything also seemed to happen too fast. I wished that Green spent more time letting the two main characters get to truly know each other because too much happened in too short of a novel. Other than that I loved it, though, I probably would have loved it more if the sad ending hadn’t been previously spoiled for me. The ending is really sad. I recommended to have a box of tissues close by. There was minimal violence and the more disturbing scenes usually involve one or more of the main characters suffering from the side effects of cancer. The two main characters do have cancer which is not a topic to be taken lightly. I would have preferred a little bit less swearing. It is a romance novel so expect some romance. This novel taught me a lot about loving someone even when it may break your heart and enjoying life because it could quickly change. I recommend this book to those who enjoy romance, but also don’t want the silly, dumbed-down teen romance novels that have no plot whatsoever.